As society evolves due to progress and individual enlightenment, American family values undergo many dramatic changes. While no single list of values fits every modern family, exploring the most common ones may help people identify values of personal significance. When asked about their family values, most people find it hard to formulate a response. The concept of values that pertain to a family unit is, in some respects, just that: a concept. These values are largely inherent, understood on an emotional level, unspoken and passed down through the generations based on personal experience. For those who are unclear about the term and what it means, it might help to look at the wording and take a literal approach. Everyone already knows that the word "family" means a social unit--whether blood-related, marriage-related or emotion-related--usually residing together. The word "values" typically means a set of beliefs and ideals (social and sometimes political) that provide moral guidance to a family unit. When you put the two terms together, it makes sense to take their collective meaning as a set of beliefs or ideals that imbue each member of the family with knowledge about right and wrong, proper moral decision-making skills and well-developed social mores. Most modern American families also include caring, love and support of the family into their system of values. Modern society breeds a contemporary viewpoint about the attributes of a family, but this was not always so. As recently as the 1950s, commonly-used American family values took a far different approach to matters of gender, equality and the family as a whole. Despite the disadvantages of those mid-20th century ideals, many of them still have a viable place in contemporary belief systems. To formulate a set of beliefs and ideals that will work best for your family, it might help to examine both the traditional and the contemporary models. Although they are not for everyone, certain aspects of traditional ideals may still appeal to a wide range of families. They represent enduring familial themes and the comfort of conventional homes. The list below includes both common and uncommon values for old-fashioned families. Those who take a more modern approach to establishing family ideals may find themselves spoiled for choice. Although progressive families practice conscientiousness in setting up a system of values to live by, they are largely free of some of the limitations present in traditional belief systems. The following list highlights some popular ideals for America's modern families. 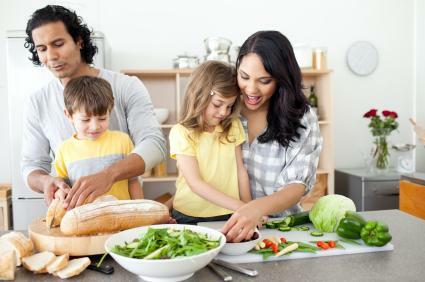 Whether you believe in traditional family roles and ideals or lean more towards the progressive, the one thing that both categories agree upon is building a loving and supportive family unit. Both groups want to instill good morals and strong character attributes into their children. In establishing American family values for your loved ones, get together with your partner and discuss the values that matter most to you. Remember that no one set of ideals works for everyone; feel free to mix and match from both categories or establish a set all your own.